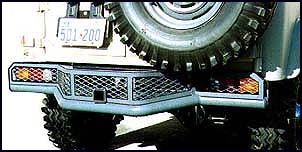 "Cool Cruisers of Texas" rear Safari Style bumper with basket and hitch receiver - Made for protection, function, strength and Good Looks. Constructed of 2 3/8" drill stem pipe, diamond plate and expanded metal. Bolt on Bumper designed with dropping tapered basket to carry chains, gear, cable or tool bag. Bumper has a universal hitch receiver for trailer hitch, rescue shackle or rear winch mount. Bumper protects rear lights and makes an excellent step for rear truck entry. Bumper is sandblasted and epoxy coated before enamel painted either black, dark gray or pewter. Finally, a clean, functional rear bumper that varries that legendary FJ-40 look from front to back. Back Bumper makes a match set to front Safari Style bumper. 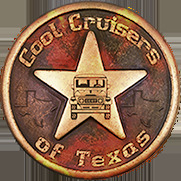 Both Bumpers are built with Exceptional QUALITY metal work and ginish... A Great Value...Made Exclusively by "Cool Cruisers of Texas."